My wife and I are going to Adepticon this year (April 11-13). We are completely stoked. The studio will be working on a few secret projects to be unveiled there. We went last year, too. This time I’m going to take a lot video. It’s not too late to have us do your army! I even have a few on hand ready to go. You can also borrow a studio army to display for us while you play. 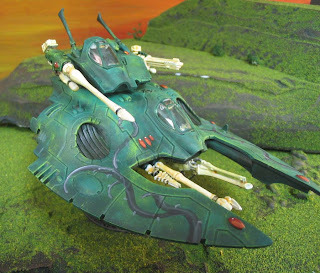 Picture: an Eldar Biel Tan Falcon. This is part of a trio of fully magnetized tanks. I know they’re good because I wish they were mine! Yesterday was insane. I had a huge inbox of inquiries, now all answered. I’ve also been working on house formulas for painting glazes. I spent several hours working with a rookie painter. 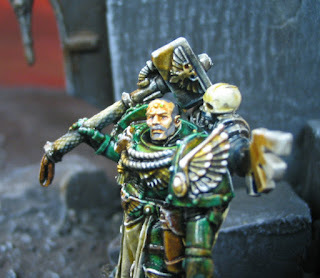 Invariably, we bring on experienced artists, but almost all are rookies with regards to painting miniatures full time. Nothing could prepare you for doing this full time professionally. The battlefield is littered with the bodies of those who thought this would be a good idea. See Angela have a nervous breakdown. I will probably not keep this up for long. This is not the typical sentiment of artists, BUT I recorded it to lend credence to my warnings to new painters. Painting for personal satisfaction is one thing: painting a relentless load of figures week in and week out is another. I am very picky about who I bring on board. I am merciless for those first six months. All artists must learn the three inch punch. You’re more likely to wash out as a painter at BTP in the first three months than you are joining the Navy Seals. However, once an artist is over the hump, the retention is really good. Speaking of which, we are light in the area of Assembly. I need to find someone who can fill that need, doing Assembly mostly and filling in as a Painter as needed. You need to be able to assemble a lot of figures week after week, and do it cleanly and with expert, narrative conversions, bases, and (basic) green stuff. If you’re interested, drop me an email with some information about yourself. This is a full-time deal! Several people have even moved here successfully. It takes about a year for a BTP painter to really get his or her “sea legs”. That’s when it gets good. This weekend I’m having a Paint Fest out at my house for Blue Table’s artists. I plan on working on the Sentinels for my Imperial Guard Lions Rampant army. Various Artists dropped by and it was ever so nice to chat with them. I was at the studio until 10pm. My wife wasn’t happy about that, but that’s what it took to get the job done! As some may have heard, the prophet of the Church of Jesus Christ of Latter-Day Saints has passed away. My wife and I were very sad. It is likely that he will be succeeded by Thomas S. Monson. Both are grandfatherly figures to us, full of wisdom and encouragement. 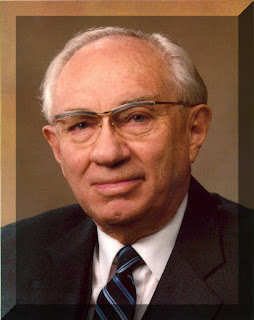 Gordon B. Hinckley was always so optimistic, telling us young people that we had everything to live for and that life would just keep getting better. Hear his last talk with his people. Read his last words to the men of the church. I’m really working on catching up on a giant email Inbox. Please bear with me! If you are ready to “place an order” please IM or call me. I will take care of you right away. See contact information in the lower right column. See All the Old Posts! I used to run this blog on Yahoo. There are about fourteen months of posts. 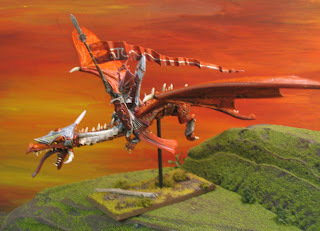 Picture: a High Elf Dragonlord in Chracian colors. Hear my expert narrative. OH, I can’t believe that I haven’t done an entry in three days. Wednesday I spent the morning tying up loose ends at the studio and the afternoon at the MTC, which was awesome. I’m training some talented rookies down at the studio and I’m pleased with what I’m seeing. What else? I’ve been watching a lot of Scrubs and Stargate. Something on Stargate scared the crap out of Griffin, he was up crying at 3am the other night and he pointed to the Stargate DVDs. So, I now only watch them when the kids are out of the room. However, I’m really in tune with Griffin and I intuitively knew what would help him sleep– I moved a little waterfall, calming sounds thing from the bathroom to his room at night. That worked like a charm. On top of that he’s been really sick with a fever these last few days. If it’s not better by Monday it’s off to the hospital. It’s really sad to see him lying there, listless. It’s funny because if we give him some medicine, as soon as he feels a little better he starts tearing around the place. About the Trollbloods, they’ve fallen to low priority in Assembly so I won’t make Hordes night this Saturday. My wife and I are going out to Sushi with a painter and his wife instead. I’m really looking forward to that. Today I had a rare in-person visit with a client which I really enjoyed. I’m cooped up alone in my flourescent tomb most of the time which is completely against my nature.